I have used ThredUp several times the last year or so as an easy way to find high quality used clothes online. I've been pleased with the selection (which changes daily) and the quality when it arrives. I'm a big fan of thrifting but as a mom in a rural area, I lack the time to search and the volume of thrift stores found in more urban areas. 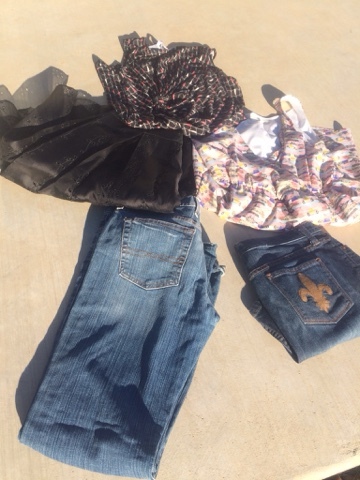 ThredUp is essentially a high quality online consignment shop. You can search by brands, sizes and clothing article. They have a pretty good selection but it does change fast. They also have shoes, accessories and purses. I have only tried women's clothing so far but they do have kids items too. Shipping is $5.95 or free if your order is over $70. You can ship returns back free. I have a referral link included in this post which allows you to get a $20 credit when you sign up. This was previously only a $10 credit so snag it soon in case it drops back to only $10. I should note that I was really pleased with the easy return process. I did return an item that didn't fit. Shipping was free back and it was very easy to print the label online. My account was credited within about a week of me sending it back. You have 14 days to decide on returns. Great process. Since trying ThredUp I have been wanting to see what selling a bag would be like. I delayed sending in for a long time because I generally don't buy great brands and most of my staple items aren't in great shape when I'm done with them. But, turns out that I have a few things that worked. They are very clear online about brands that they don't buy. The cheaper the item was to begin with, the less likely they are to want to buy it. So those Target dresses from last summer, probably not going to want to send those. They have a great selling tool online that will give you an idea of what items that will and won't buy as well as what they may pay. The range they offered was pretty accurate. They estimate that they only buy about 40% of what is shipped to them. They screen them heavily - which I appreciate as a buyer. You can have the clothes shipped back to you that they don't buy, but they will charge you shipping. I elected to just have the items donated. PS - Apologies to my sister if she would have wanted the items they didn't buy. Step 5 - seal up the bag and take it to FedEx or the Post Office - I like that either works. Step 6 - wait for your email to show you the money! It was really nice to have the bag postage prepaid (and shipping was free) and be able to go to the Post Office or FedEx. Us rural gals don't have many FedEx options but we do have USPS. 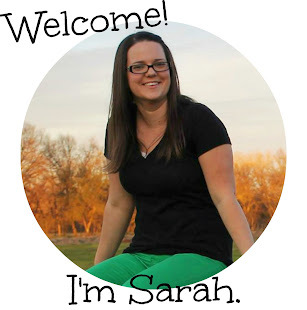 Kudos to ThredUp for that. 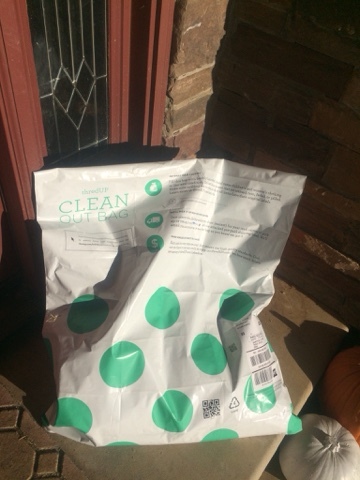 My filled clean out bag, ready for the mailman. I should mention that due to high volume it did take them almost 30 days to process the bag. But I got email updates which was reassuring. For a total of $12.50. "Guess what else! By UPcycling your clothing, you've saved 2100 gallons of water, 48 pounds of CO2, and you've helped 3 different families find great clothing at affordable prices. " Overall I'm very pleased with the experience. I probably won't be sending bags too often but I probably will make a point to sort my Goodwill piles to check for anything that I could sell. The process was very easy and now with items that were collecting dust, I can get something I may like better. So what do you think? I would love to hear from others who have tried it.